Acting Director for the Virgin Islands Shipping Registry, Captain Raman Bala said this notice is being issued in accordance with section 163 of the Merchant Shipping Act, 2001 and failure to adhere to this warning is an offence as per the National Parks Trust Act 2006, Sections 3-6. The Acting Director said red and yellow flags mark areas that are patrolled by lifeguards and are the safest place to swim at the beach, while black and white flags mark areas that are for use by craft only. Beachgoers are warned against swimming in these areas. 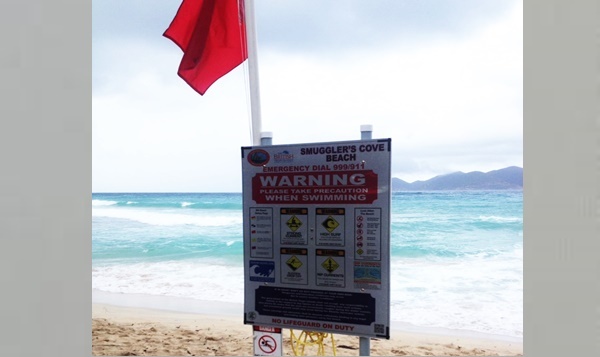 He said red flags represent DANGER and beachgoers are advised against swimming in these areas when the flag is flying. The red flag present at the Baths, Devils Bay & Spring Bay National Parks Trust also signifies that boats are prohibited from using the mooring field. Captain Bala further explained that swimmers should exercise caution where yellow flags are placed. Weak swimmers are advised to avoid swimming in these areas. The yellow flag at the Baths, Devils Bay & Spring Bay (National Parks Trust) also signals that boats should exercise caution when using the mooring field, while the purple flags indicate a marine life warning including the presence of Jellyfish. Persons interested in being added to the daily email updates regarding the flag status should contact Lifeguard Supervisor at the Conservation and Fisheries Department, Mr. Mark Street at surflifebvi@hotmail.com or telephone the National Parks Trust office on Virgin Gorda via telephone at 346-2779. 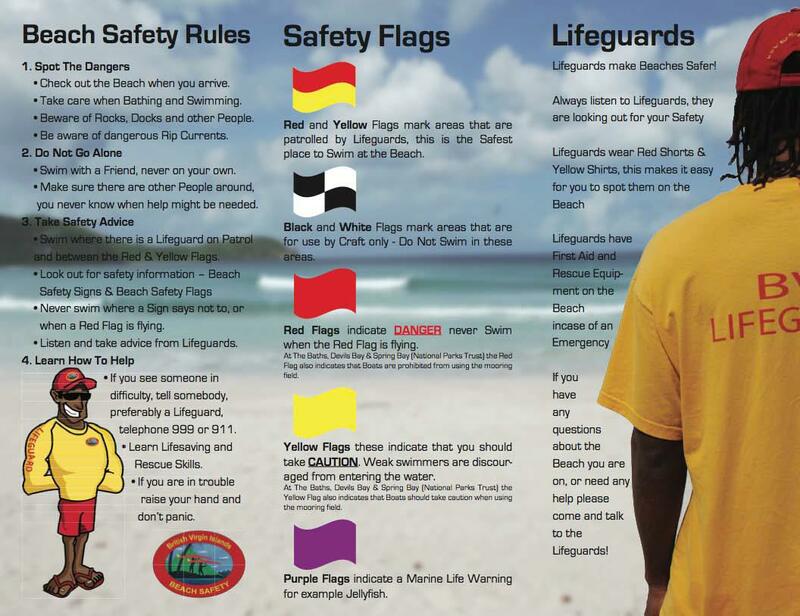 Beach Safety Rules and Safety Flags Explanation.